A population bottleneck (or genetic bottleneck) is a sharp reduction in the size of a population due to environmental events (such as earthquakes, floods, fires, disease, or droughts) or human activities (such as genocide). Such events can reduce the variation in the gene pool of a population; thereafter, a smaller population, with a correspondingly smaller genetic diversity, remains to pass on genes to future generations of offspring through sexual reproduction. Genetic diversity remains lower, only slowly increasing with time as random mutations occur. In consequence of such population size reductions and the loss of genetic variation, the robustness of the population is reduced and its ability to survive selecting environmental changes, like climate change or a shift in available resources, is reduced. Conversely, depending upon the causes of the bottleneck, the survivors may have been the genetically fittest individuals, hence increasing the frequency of the fitter genes within the gene pool, while shrinking it. This genetic drift can change the proportional distribution of an allele by chance and even lead to fixation or loss of alleles. Due to the smaller population size after a bottleneck event, the chance of inbreeding and genetic homogeneity increases and unfavoured alleles can accumulate. A slightly different form of a bottleneck can occur if a small group becomes reproductively (e.g. geographically) separated from the main population, such as through a founder event where for example a few members of a species successfully colonize a new isolated island, or from small captive breeding programs such as animals at a zoo. Population bottlenecks play an important role in conservation biology (see minimum viable population size) and in the context of agriculture (biological and pest control). According to a 1999 model, a severe population bottleneck, or more specifically a full-fledged speciation, occurred among a group of Australopithecina as they transitioned into the species known as Homo erectus two million years ago. It is believed that additional bottlenecks must have occurred since Homo erectus started walking the Earth, but current archaeological, paleontological, and genetic data is inadequate to give much reliable information about such conjectured bottlenecks. That said, the possibility of a severe recent species-wide bottleneck can be ruled out. A 2005 study from Rutgers University theorized that the pre-1492 native population of the Americas are the descendants of only 70 individuals who crossed the land bridge between Asia and North America. The controversial Toba catastrophe theory, presented in the late 1990s to early 2000s, suggested that a bottleneck of the human population occurred c. 70,000 years ago, proposing that the human population was reduced to perhaps 10,000–30,000 individuals when the Toba supervolcano in Indonesia erupted and triggered a major environmental change. Parallel bottlenecks were proposed to exist among chimpanzees, gorillas, rhesus macaques, orangutans and tigers. The hypothesis was based on geological evidence of sudden climate change and on coalescence evidence of some genes (including mitochondrial DNA, Y-chromosome DNA and some nuclear genes) and the relatively low level of genetic variation in humans. However, subsequent research, especially in the 2010s, appeared to refute both the climate argument and the genetic argument. Recent research shows the extent of climate change was much smaller than believed by proponents of the theory. In addition, coalescence times for Y-chromosomal and mitochondrial DNA have been revised to well above 100,000 years since 2011. Finally, such coalescence would not, in itself, indicate a population bottleneck, because mitochondrial DNA and Y-chromosome DNA are only a small part of the entire genome, and are atypical in that they are inherited exclusively through the mother or through the father, respectively. Genetic material inherited exclusively from either father or mother can be traced back in time via either matrilineal or patrilineal ancestry. In 2000, a Molecular Biology and Evolution paper suggested a transplanting model or a 'long bottleneck' to account for the limited genetic variation, rather than a catastrophic environmental change. This would be consistent with suggestions that in sub-Saharan Africa numbers could have dropped at times as low as 2,000, for perhaps as long as 100,000 years, before numbers began to expand again in the Late Stone Age. European bison, also called wisent (Bison bonasus), faced extinction in the early 20th century. The animals living today are all descended from 12 individuals and they have extremely low genetic variation, which may be beginning to affect the reproductive ability of bulls. The population of American bison (Bison bison) fell due to overhunting, nearly leading to extinction around the year 1890, though it has since begun to recover (see table). Overhunting pushed the northern elephant seal to the brink of extinction by the late 19th century. Though they have made a comeback, the genetic variation within the population remains very low. 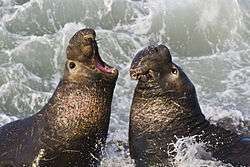 A classic example of a population bottleneck is that of the northern elephant seal, whose population fell to about 30 in the 1890s. Although it now numbers in the hundreds of thousands, the potential for bottlenecks within colonies remains. Dominant bulls are able to mate with the largest number of females — sometimes as many as 100. With so much of a colony's offspring descended from just one dominant male, genetic diversity is limited, making the species more vulnerable to diseases and genetic mutations. The golden hamster is a similarly bottlenecked species, with the vast majority of domesticated hamsters descended from a single litter found in the Syrian desert around 1930, and very few wild golden hamsters remaining. The genome of the giant panda shows evidence of a severe bottleneck that took place about 43,000 years ago. There is also evidence of at least one primate species, the golden snub-nosed monkey, that also suffered from a bottleneck around this time. Further deductions can sometimes be inferred from an observed population bottleneck. Among the Galápagos Islands giant tortoises — themselves a prime example of a bottleneck — the comparatively large population on the slopes of the Alcedo volcano is significantly less diverse than four other tortoise populations on the same island. DNA analyses date the bottleneck to around 88,000 years before present (YBP). About 100,000 YBP the volcano erupted violently, burying much of the tortoise habitat deep in pumice and ash. Bottlenecks also exist among pure-bred animals (e.g., dogs and cats: pugs, Persian) because breeders limit their gene pools by a few (show-winning) individuals for their looks and behaviors. The extensive use of desirable individual animals at the exclusion of others can result in a popular sire effect. Before Europeans arrived in North America, prairies served as habitats to greater prairie chickens. In Illinois alone their numbers plummeted from over 100 million in 1900 to about 50 in 1990. These declines in population were the result of hunting and habitat destruction, but the random consequences have also caused a great loss in species diversity. DNA analysis comparing the birds from 1990 and mid-century shows a steep genetic decline in recent decades. The greater prairie chicken is currently experiencing low reproductive success. Genetic bottlenecks exist in cheetahs. Research showed that there is no genetic variability in the genome of the Wollemi Pine (Wollemia nobilis). There are only around 100 specimens in the wild and tens of thousands cultivated. This indicates that the species went through a severe population bottleneck. In conservation biology, minimum viable population size (MVP) helps to determine the effective population size when a population is at risk for extinction. There is considerable debate about the usefulness of the MVP. ↑ Hufbauer RA, Bogdanowicz SM, Harrison RG (February 2004). "The population genetics of a biological control introduction: mitochondrial DNA and microsatellie variation in native and introduced populations of Aphidus ervi, a parisitoid wasp". Molecular Ecology. 13 (2): 337–48. doi:10.1046/j.1365-294X.2003.02084.x. PMID 14717891. 1 2 Hawks J, Hunley K, Lee SH, Wolpoff M (January 2000). "Population bottlenecks and Pleistocene human evolution". Molecular Biology and Evolution. 17 (1): 2–22. doi:10.1093/oxfordjournals.molbev.a026233. PMID 10666702. ↑ "North America Settled by Just 70 People, Study Concludes". LiveScience. 2005-05-25. Retrieved 2010-04-01. 1 2 Dawkins, Richard (2004). "The Grasshopper's Tale". The Ancestor's Tale, A Pilgrimage to the Dawn of Life. Boston: Houghton Mifflin Company. p. 416. ISBN 0-297-82503-8. ↑ Prothero, Donald R. (2013-08-01). Reality Check: How Science Deniers Threaten Our Future. Indiana University Press. p. 263. ISBN 9780253010360. ↑ Ambrose SH (June 1998). "Late Pleistocene human population bottlenecks, volcanic winter, and differentiation of modern humans". Journal of Human Evolution. 34 (6): 623–51. doi:10.1006/jhev.1998.0219. PMID 9650103. ↑ "Doubt over 'volcanic winter' after Toba super-eruption. 2013". Phys.org. 2013-05-02. Retrieved 2015-10-31. ↑ Dawkins, Richard (1995). "All Africa and her progenies". River Out of Eden. New York: Basic Books. ISBN 0-465-01606-5. ↑ Behar DM, Villems R, Soodyall H, et al. (May 2008). "The dawn of human matrilineal diversity". American Journal of Human Genetics. 82 (5): 1130–40. doi:10.1016/j.ajhg.2008.04.002. PMC 2427203 . PMID 18439549. Lay summary – BBC News (April 24, 2008). ↑ Luenser, K.; Fickel, J.; Lehnen, A.; Speck, S.; Ludwig, A. (2005). "Low level of genetic variability in European bisons (Bison bonasus) from the Bialowieza National Park in Poland". European Journal of Wildlife Research. 51 (2): 84–7. doi:10.1007/s10344-005-0081-4. ↑ Zhang, Ya-Ping; Wang, Xiao-xia; Ryder, Oliver A.; Li, Hai-Peng; Zhang, He-Ming; Yong, Yange; Wang, Peng-yan (2002). "Genetic diversity and conservation of endangered animal species". Pure and Applied Chemistry. 74 (4): 575–84. doi:10.1351/pac200274040575. ↑ Beheregaray LB, Ciofi C, Geist D, Gibbs JP, Caccone A, Powell JR (October 2003). "Genes record a prehistoric volcano eruption in the Galápagos". Science. 302 (5642): 75. doi:10.1126/science.1087486. PMID 14526072. ↑ "Brain & Ecology Deep Structure Lab". Brain & Ecology Comparative Group. Brain & Ecology Deepstruc. System Co., Ltd. 2010. Retrieved March 13, 2011. ↑ "Dating the genetic bottleneck of the African cheetah." (PDF). Proc Natl Acad Sci U S A. 90: 3172–6. Apr 1993. doi:10.1073/pnas.90.8.3172. PMC 46261 . PMID 8475057. ↑ Gilpin, M.E. ; Soulé, M.E. (1986). "Minimum viable populations: The processes of species extinctions". In Soulé, Michael E. Conservation biology: The science of scarcity and diversity. Sunderland Mass: Sinauer Associates. pp. 13–34. ISBN 978-0-87893-794-3. ↑ Soulé, Michael E., ed. (1987). Viable populations for conservation. Cambridge: Cambridge Univ. Press. ISBN 978-0-521-33657-4. 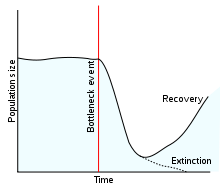 Wikimedia Commons has media related to Population bottleneck. Hawks J, Hunley K, Lee SH, Wolpoff M (January 2000). "Population bottlenecks and Pleistocene human evolution". Molecular Biology and Evolution. 17 (1): 2–22. doi:10.1093/oxfordjournals.molbev.a026233. PMID 10666702. Lay summary – University of Michigan, Department of Anthropology (January 10, 2000). Nei M (May 2005). "Bottlenecks, genetic polymorphism and speciation". Genetics. 170 (1): 1–4. PMC 1449701 . PMID 15914771.